Green membership overtakes Lib Dems and UKIP. Here's 13 reasons why. Today, membership of the Green parties in the UK overtook that of the Lib Dems - only hours after it had overtaken UKIP. Here are 13 reasons for this astounding growth. After thousands of new members have joined this week, the Green Parties in Scotland and England and Wales now have more than both UKIP and the Lib Dems. Farage's party has 41,943, the Lib Dems head of membership tells me that they now have 44,680. On Wednesday, the Greens gained 2,000 members across the UK and overtook UKIP. Today, Thursday, so far, they've gained more than 2,000 more. As I write, Scottish Greens + the Green Party of England and Wales are at a combined total of 44,713. In 2003, there were around 5,000 signed up Greens across the UK. That's about the same number as has joined this week. What's caused this growth, which has now so dramatically accelerated? There's something strange about British politics: an obsession with process. A huge portion of people feel that the exclusion of the Greens from the election debates is unfair. For those who vote Green, or were thinking about it, being told that their chosen party isn't significant is almost a personal affront. Hundreds of thousands signed a petition calling on the Greens to be included. Some clearly decided that they'd go one step further, and sign up. 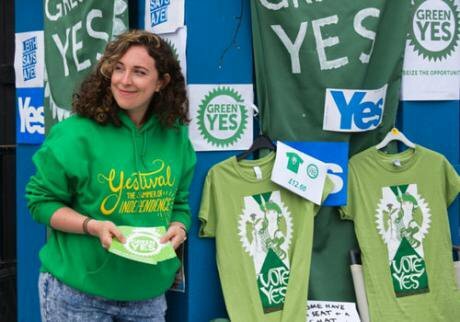 A huge portion of the growth took place in Scotland the week after the independence referendum – when the Scottish Greens grew from 1,800 members to 7,500. But it wasn't just in Scotland. There was a significant surge in Green support in England and Wales that week too. As one new member in Oxford put it to me, they and their partner had been students at Glasgow university. They were excited by the radical independence campaign, ‘Green Yes’, and the broader Yes movement. That's what inspired them to join. It's been twenty-one years since Tony Blair became leader of Labour. And throughout that time, despite ‘modernising’ it he also become a shield for it. People could persuade themselves that they still supported Labour, they just didn't like Blair. When Miliband came in, the excuses were gone. What was clearly the most left of the centre-left candidates of Labour had won the leadership. And the party still supported austerity. Without the charisma he could not be blamed personally, people started to look more closely at the party as a whole, and have found it wanting. Look at a timeline of the growth in Green membership, and there were two, almost simultaneous events which happened before it started. If one was the referendum, the other was the 2014 Labour Party conference. Perhaps in a bid to stem the Green tide, Ed Miliband gave a speech about how much he cares about climate change. Now, here's the thing. I suspect he means it. But saying you care about climate change if you aren't willing to stand up to big oil companies would be like saying you care about inequality without being willing to tackle bankers' bonuses. The fundamental problem in society is the power of massive corporations – of capital. And as long as Miliband and Balls promise to retain Tory cuts, as long as Labour remains a party of austerity, they will always look like they are on the side of capital, not ordinary people. To put it another way, people have joined the Green Party because it opposes austerity and Labour doesn't: the Greens have become the reasonable party of the left. A huge portion of the new Green membership is under the age of 30. The older ones in this group largely voted Lib Dem in 2010, and were then disenchanted not just by the trebling of fees but the blatant cynicism of Lib Dem leaders betraying their solemn promises. The younger ones are of the sort who the Lib Dems were good at attracting five years ago. No more. For a long time, Lib Dems were able to appeal to different electorates by pretending to be very different things. Being in government meant they could only be one of those things. One consistent message from new members is that they felt so horrified by the rise of UKIP that they had to do something. The sense that the Greens have been the only party standing up to UKIP rather than pandering to them seems to have attracted many to the party. A case in point here is the surge in Green membership around the Rochester and Strood by-election, where the party ran with the slogan “say no to racism”. When I got off the train in Rochester on polling day, the first person I bumped into had a big Green Party badge on, and had just joined, largely for that reason. Likewise, though it's uncomfortable for many Greens to admit this, UKIP have reshaped British politics in a way that's good for outsiders of all hues. They've shown that you can have huge political influence by supporting a party that will almost certainly not be in government; along with the SNP, they've made newer and smaller parties the major story of this election, and they've generated (along with the Yes campaign) a sense that the establishment is on the run. These things all help Greens. Perhaps the most extraordinary thing about the growth of the Greens is that around a quarter of new members are under 30. It used to be that the first rule of generation Y was “don't join anything”. The fact that thousands have broken that is fascinating. Specifically, the generation who flooded central London with angry protests four years ago has now graduated, and is facing a general election. Looking for political organisations they can join now that their student union days are behind them and their university societies distant memories, they've largely rejected – or, more tellingly, not even considered, the NGOs that the New Left of their parents generations built. They are interested in questioning power and the inter-relationships between problems, not just campaigning on one single issue after another. They don't just want to sign petitions, they want to organise collectively to challenge those who rule them, and the Green Party has become a key path to do that through. If the referendum and the Labour conference were the two external events which kicked off the surge, there was an internal one too. 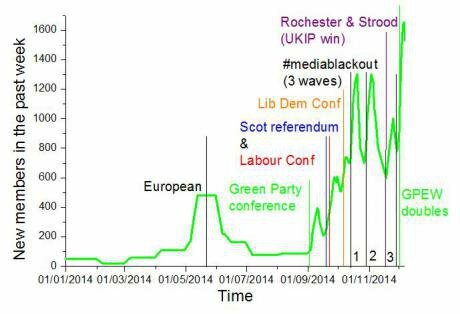 The Green Party of England and Wales got quite a lot of coverage, back in September, for passing 20,000 members. This chat about joining clearly acted as an encouragement to lots of people to join, because there was a huge boost to membership in the next few days. Natalie Bennett is the second ever Green Party leader – before her, there was Caroline Lucas, and before her, there wasn't a leader. Caroline, because she was candidate and then MP in the target constituency, had to pour a huge amount of her time into Brighton. Natalie, on the other hand, has been touring the UK, often speaking to public meetings two or three times a week. On Wednesday night, the day that 2,000 people joined the party, 600 people in Exeter turned out to hear Natalie Bennett speak (see picture below). 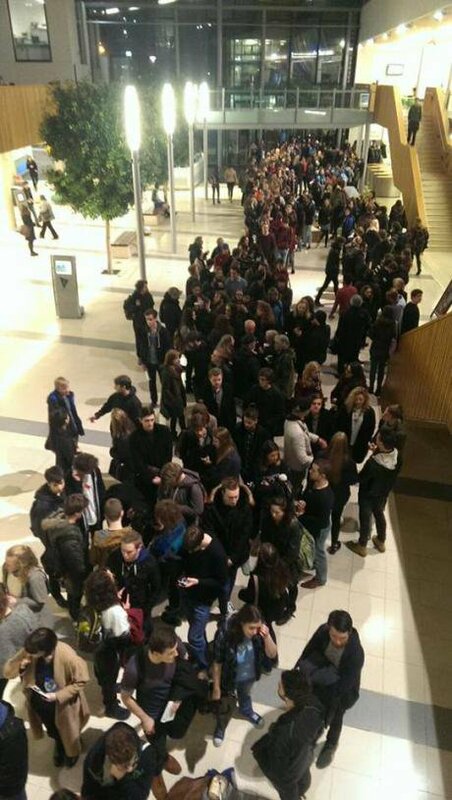 Tonight, hundreds are hearing her speak in Norwich. For two and a half years, week after week, local parties have reported surprisingly large turnouts – with two or three hundred people showing up where they usually get five to a meeting. That means there are thousands of people across the country who've been to a public meeting with Natalie Bennett. I know some who have joined directly because of that. It's worth asking the question: of the new members, who finally made up their mind and joined because of one of the more short term factors above, how many were in one of those meetings? Or were recruited by someone who joined at one of those meetings? Greens have always been on the left. But they haven't always been very good at sounding like it. Instead, too often, they've sounded like a sort of preachy hair-shirt party, who wants to tax anything fun. Of course, more often this is an image painted of the party by its enemies, but Greens haven't always been brilliant at challenging it. Equally damaging, there's long been a sense that Greens are a single-issue environmental party. In order to combat this, it was important that Greens spend a lot of time telling a different story about themselves. And, for years, they largely failed to do this – instead using party communications to appeal to the select group who already agreed. With Caroline and then Natalie out in front, and with the (left leaning and very influential) Young Greens and groups like Green Left organising among the activists, the image presented in recent years has been much more consistently left. Gone are the days of “not left or right but forwards”. The party is now clearly an electoral expression of the emerging new left. Last year, the minority in the party who don't like this (old fashioned ecologist liberals) set up a group to oppose this shift. As a response to the “watermelons” of Green Left (green on the outside, red in the middle), they established a conference newsletter “the kiwi and the lime” (green all the way through). Their protests were largely ignored, and the surge in membership is the party's reward: at new members meetings all across the country, people cite the Greens opposition to austerity, and being the only party left on the left, as key reasons for joining. 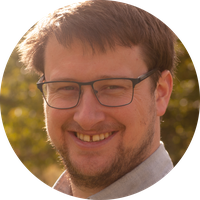 For a long time, Greens had radical policies – like supporting Basic Income – but were often a little embarrassed to talk about them. Natalie Bennett, who has an impressive grasp of the complexities of policy, has been more comfortable highlighting such ideas. After the financial crisis, huge numbers are coming to the conclusion that ideas which aren't radical aren't enough, and Greens have got a lot better at attracting them. For years, the party used to seem to basically put out press releases in response to external events, long after the articles about them had been written. Not only was this a useless media strategy, it also failed to tell any clear story about who the party was. And so people accepted stories written by others (cf hair shirts). Since Natalie's taken over, they've been much better at gaining proactive media coverage, and been much more willing to embrace conflict and controversy (because the opposite of being controversial is being ignored). Whether gaining headlines by announcing support for a £10 minimum wage or getting praise for bare-knucked denunciations of Farage's migrant-bashing, the leading Greens have got much better at using the media to paint a picture of a party that's on the left side of the brewing culture war, that's fearless in the face of the establishment. Of course, what happens next is all to play for.